The new ALM machine at the Hayden facility takes the hand out of hand layup, provides customers significant cost savings and is ideal for cleats, clips and angle brackets. 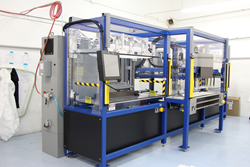 AGC AeroComposites, a global composites and metal components and assemblies manufacturer for the aerospace and defense industry, has invested in the development and deployment of a proprietary Automated Lay-up Machine (ALM) for the fabrication of composite structures and components. The machine is in service at the company’s site in Hayden, Idaho which specializes in manufacturing both structural and non-structural advanced composites. By investing in this advanced technology, AGC AeroComposites can provide significant cost reductions when compared to traditional hand lay-up processes. The machine is ideal for products such as cleats, clips, angle brackets and intercostals. The ALM conforms to existing process specifications, does not require engineering changes and uses existing or inexpensive new tooling. The ALM is now operational at the Hayden facility. More complex geometries for composite products are being explored for future development. See more about this groundbreaking technology here.